How long does my hair have to be to start dreds? We recommend at least two inches of growth, may vary depending on your hair texture. If I have a relaxer/ texturizer can I get comb/coiled twist? Usually no, because the natural (unrelaxed) coils in the hair enable the hair to twist. Because relaxers loosen the natural coil, it prevents the hairs' ability to twist. However, the new growth can be twisted. What's the difference between dreds & comb/coiled twists? Twist are the first step in the dreadlock process. If you are NOT locking, twists are combed out before returning to redo the style. Can I get twists if my hair is long (over 4 inches)? How long is the locking process? Progressively- from one month to a year. How long does it take to twist? An average of one to three hours, depending on the length and thickness of the hair. How often do I have to get hair maintained? Approximately every three to four weeks, depending on the style and texture of hair. After wearing locs for several years, can they be combed out? In some instances yes. However, it is not recommended. An alternative suggestion is to cut them to a more manageable length or grow out new growthto a desired length and then, cut locs out. Do you offer combing out locs as a service? Can I swim with a twist? With some styles and textures, yes, although it is only recommend with a swim cap. How long does it take to grow out of a relaxer? 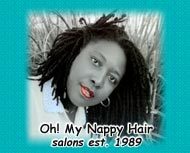 Three to six months to establish enough new growth for most of the natural hairstyles. However, there are styles we can do with your hair, while growing out & gradually cutting off the relaxer. How long do twists and other styles last? hair type and hair condition.